Hot water is a luxury and necessity that many have, but sometimes finding a good water heater can be difficult. Some don’t seem to heat water enough while others tank water heater expires too quickly. However, we’re here to help provide a guide in your search for the best tankless heaters. We’ll be taking a look at some of the best whole house tankless water heaters on the market. First up on our list is the Stiebel Eltron Tempra 29 Plus. This whole house electric water heater certainly does some heavy lifting. And is one of the more pristine units out there for tankless water heaters. One of the most appealing things about the Tempra 29 Plus is its size and compatibility. Once you’ve installed it, you’ll hardly notice it there. The Tempra 29 Plus is very straightforward with its installation, so don’t you worry about struggling with this unit all day to get it going. The Tempra 29 Plus includes a digital temperature display along with an easy-to-use dial selector. This dial allows you to set the temperature of the water anywhere between 86 and 140F. This is particularly useful if you want to adjust the temperature just a tiny bit instead of having to switch from hot to scalding hot. You can easily bump it up a few degrees and test it out until you’re satisfied at the heat. Ever had a unit start to corrode on you? This can be expensive as it means having to buy new parts to replace the ones gone bad and it’s just more mayhem for you. We’ve all had this happen, and nobody wants to spend their Saturday replacing parts for their water heater. With the Tempra 29 Plus, you won’t have to worry about corrosion! The components used to make up this unit are corrosion resistant, so even through the months and years, your unit will still be in pristine shape! Easily the most impressive quality of the Tempra 29 Plus is its adaptability! What do we mean by that? This tankless electric water heater can detect the temperature of the incoming water. And adjust to how much power is needed to maintain that temperature. This tankless heater will either give more power or less depending on the flow of the water and how much is needed. Why is this such a good thing for you? It saves you money on energy costs! Instead of a unit that runs the same amount of energy all day long, this unit only uses what is needed and nothing more! This whole house heater will either give more power or less depending on the flow of the water and how much is needed. Why is this such a good thing for you? It saves you money on energy costs! Instead of a unit that runs the same amount of energy all day long, this unit only uses what is needed and nothing more! In short, the Stiebel Eltron Tempra 29 Plus is an excellent electric tankless water heater for the whole house, and I would highly recommend it if you live in warmer climates. If you live in a colder climate, I recommend looking elsewhere due to its inability to adapt to the colder temperatures as well as other units. It's small, compact size and easiness in use make this unit an excellent water heater to pick up and install. Next, let's move onto the SioGreen IR14K220. This particular water heater specializes in durability. One of the biggest problems with water heaters is the issue of corrosion. When you are dealing with water, corrosion soon follows. So, this unit set out to beat that problem once for and all by making itself one of the most durable units out there as far as tankless water heaters go. Why does this unit excel at this where others fail? The biggest reason would be that the SioGreen IR14K220 does not use any metallic components. Where there's no metal, corrosion is less likely to happen. 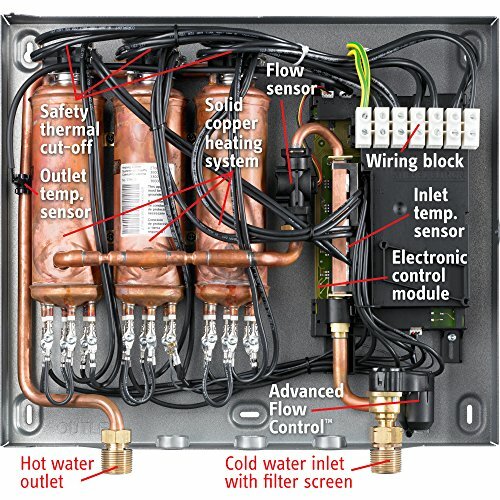 This electric hot water heater instead uses quartz heating elements. The durability of this unit can go up to 10 years far exceeding many of the tankless water heaters out there. This is a great sign for buyers as you won't have to worry about buying a new unit or buying new parts saving you more money in the long run! One of the best things about this unit, however, is its self-cleaning capability. This makes it virtually maintenance free for you! We know you don't want to have to deal with cleaning out a water heater. It can be nasty work. That is why this unit is so alluring because it does what many units out there do not. It takes one more thing off of your list to do. Now, the biggest question will be can it handle hot water with two showers running at once? The answer to that is yes! In fact, it can even handle three showers at once though the water will drop in temperature a bit. This goes for both warmer and colder climate areas. Of course, it will perform better in your warmer climate areas, but it can hold its own in the cold further up north. This tankless water heating is a perfect unit for small apartment complexes with two or more people living there or your average-sized home. The durability of this unit alone is nearly worth the price, but it also has other great charms as well to it. The SioGreen IR14K220 is a top of the line water heater as far as durability goes. Its ability to save you money on energy costs by adjusting the water flow and temperature is very appealing as well. Whether you live in a warmer climate or colder, this unit is capable of providing you with hot water and with multiple showers. 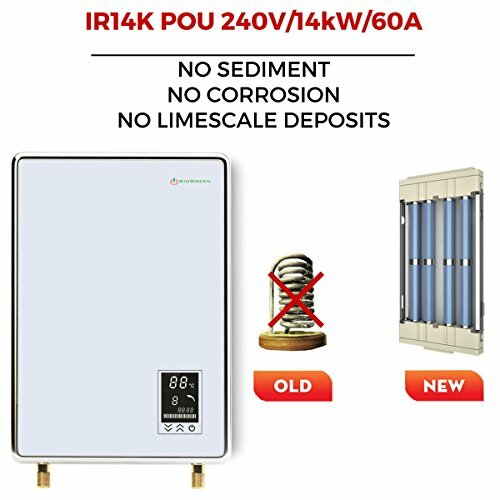 If you're willing to pay a professional to install this unit, then this may be the IR14K220 that you're looking for! Up next on our list is the BOSCH Tronic 6000 C. This water heating is not at the top of the list of water heaters, but it's not at the bottom either. It runs somewhere in the middle of the pack, and we'll tell you why. First off, the BOSCH Tronic 6000 C can provide hot water for smaller homes and apartments. This unit struggles when trying to provide hot water for your larger homes making it not the best choice if you're going to run more than one shower at a time. While it does boast the title of being a whole house water heater, it struggles to provide hot water for a whole house. This unit works its best for one or two people and certainly not a family of four or larger. However, for those of you who are living in a smaller home and you're living on your own, this water heater can get the job done for one person. Another noteworthy mention of this unit is that it does work best in warmer climates where the incoming water is above 45F. If the incoming water is colder than that, this unit struggles to deliver hot water promptly. The unit does have a dial which allows you to select the temperature you want, but this doesn't do too much if the water is too cold coming in. If you're living in a colder climate area, this unit is not the one for you. Lastly, this unit does do well in conserving energy. It's certainly not the best in doing so, but it does hold its own in saving energy while still providing hot water. One thing to mention, however, is the hefty installation cost that this unit comes with. This unit must be installed professionally, and so costs begin to pile up to get this unit installed. While it does save you on energy costs, it takes a long time for this unit to make that money back due to the expensive fees early on. 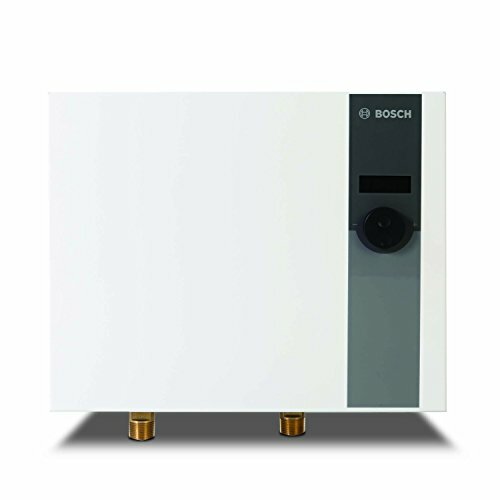 In short, the BOSCH Tronic 6000 C is a capable water heater unit. If you are living alone in a small apartment, this unit could be considered. However, the costs to pay for installation and labor make this very unappealing for those with not much income. If you're living in a larger home or a colder climate, continue to look for a different water heater as this isn't the one for you. This unit can get the job done, but it's nothing special. Last on our list is the Rheem RTGH-95XLP propane outdoor whole house water heater. It may be last on the list, but it is certainly not the least of these water heaters. Unlike our previous water heaters on this list, this heater does reside outside, and it packs a punch. This water heater is designed to cater to your larger homes instead of your small apartments or homes. In fact, this unit can handle three bathrooms and appliances all at once if necessary. This condensing tankless water heater is a horse and works just as hard to make sure you've got the hot water you need. This capability makes it very appealing for many homeowners and larger families who typically have multiple showers or sinks running at one time. If that's you, this unit can take care of your needs. Also, this unit is made for the cold. A lot of water heaters do their best work when the incoming water is warm making it easier to heat it up. However, this unit can handle outdoor temperatures of thirty below and water temperatures incoming at 35F. Just be careful to make sure your unit is out of the wind when outside to avoid accelerated corrosion. It can withstand the temperatures, but the elements can take its toll on this unit. If you're living further north where you need hot water to survive in the winter months, take a closer look at this unit. It can get the job done exceptionally well when it's coldest. Now, one issue that arises with outdoor water heaters is having a lack of control on the temperature of the water. For most, it requires that you go outside to adjust the temperature from there. This unit does not have that problem as it also includes a remote control for you. Instead of having to brave the cold to go bump up the heat, you simply have to use your remote to either increase or decrease the temperature of the water. This makes the unit very user-friendly and easier to handle. Lastly, we encourage that you have a professional come out and install it just to be safe. However, you don't necessarily have to have a professional do this. It can be installed by you if you know what you're doing and follow instructions carefully. This unit comes with what you need to install it so it could save you money on installation costs as well. 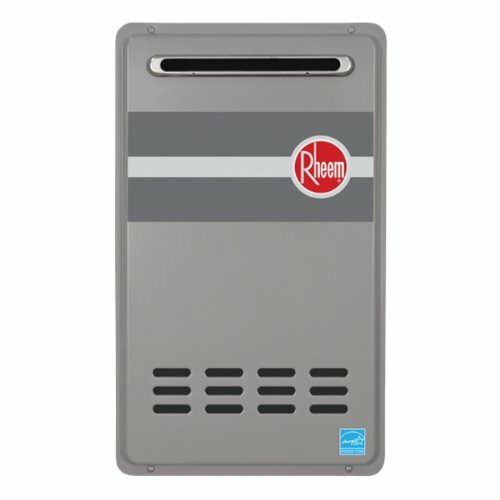 In short, the Rheem RTGH-95XLP is an excellent water heater that is as good as they come. It works best in cold climates and with larger homes making it a great unit for large families. Its remote control allows you to change the temperature without having to leave your home. And it can be installed by a professional or yourself depending on your preference. Our concern would be its durability, so we encourage you to put it in a place that's safe from the elements when installing it. All in all, this unit is a great buy that will provide hot water continuously for you and your family. If you're looking to upgrade your current water heater, it can be a daunting task to find the "right" one. However, we're here to help make it easier on you in selecting the water heater best suited for you. We'll be taking a look at tankless or on demand water heater for this guide and what to look for in your unit and what you need. Immediately, you need to ask yourself, "How much water do I use in a single day?". This will help narrow down what type of heater you'll need. For example, if you only have two people living in an apartment, you don't need a water heater that supports 4-5 people. We'll break this down into the FHR and GPM. 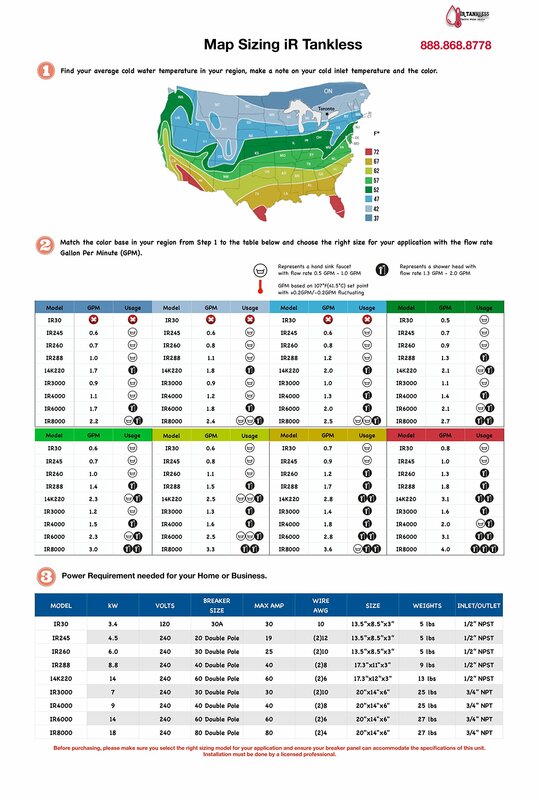 FHR stands for first-hour rating, and GPM stands for gallons-per-minute. 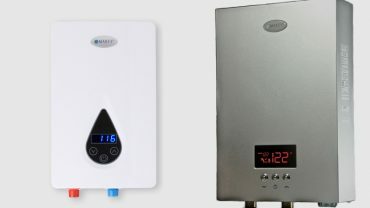 These two will tell you how much hot water the unit can provide within the first hour. So, if your family is taking four showers a day, washing clothes, running a dishwasher, and sinks then you'll need a unit with a larger GPM and FHR. However, if you're only using one shower or two and washing clothes once a week, then you'll need a unit with a smaller FHR and GPM. The point is, you don't want to overpay for something you don't need. Once you have an idea of how much hot water you use in a day, you can begin to look for water heaters that have the GPM that you need. Since we're talking about tankless heaters, let's clarify that tankless water heaters do not store water themselves. Instead, they use heating coils that heat the water as you use it. These water heaters are very energy-efficient and can save you money on electricity costs, but these units only have a limited flow rate of hot water per minute. Typically, it's anywhere between 3-4 gallons per minute, so if you are using more than that per minute, a tankless water heater may not work for you. Also, tankless water heaters work best for homes that use natural gas. Why is this? Electric tankless water heaters work well, but many call for an electrical upgrade in many homes. This means that not only would you have to buy the unit, but you would also have to pay to upgrade your electrical wiring in your home to be able to support the new unit. This can be very costly, so we recommend not buying a unit that requires you upgrade your home to support it. While there are electric tankless heaters, there are also tankless water heaters that run on propane or gas so have no fear if you don't want to go the electric route. Propane water heaters are just as effective and sometimes stronger than their electric counterpart. We recommend you examine your home and what fits best before purchasing your unit. It's also essential that you examine your climate before buying the water heater. Some water heaters excel in cold weather while others do not. If you live in consistent cold weather, you need to find a water heater that is designed specifically for that. If you don't, you'll have to deal with warm water in your showers and sinks until you can find a new one to replace that one. Be sure to see if the water heater deals well with cold incoming water or not. This is critical information to know, and you should always ask questions before buying. To wrap things up, tankless water heaters are an excellent choice for many people. We listed some of our favorites for you to look at, and we even broke down what you should look for when purchasing your water heater. Remember, it's very important to examine what you need, and that you don't purchase anything over that. Otherwise, you're left with a unit that costs more and doesn't do anything extra for you. Whether you live in a warm or cold climate, there is a tankless water heater out there for you.